Amanda M. Pinto is an associate with Paterson, MacDougall LLP, practising primarily in the areas of Municipal Liability, Aviation Law and Wills and Estates. She has represented clients in various matters before the Ontario Superior Court of Justice, the Divisional Court, the Court of Appeal, the Smalls Claims Court and the Human Rights Tribunal. She routinely argues contested motions and has conducted trials, pre-trials, examinations for discovery, settlement conferences, and mediations. Amanda was an articling student at Paterson, MacDougall LLP prior to joining the firm as an Associate in 2012. Amanda received her J.D. and LL.L from the University of Ottawa, being part of the first graduating class of the Programme de droit canadien, an intensive three year bilingual and bijuridical program. 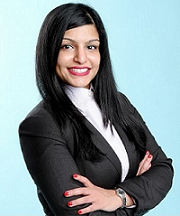 During law school, Amanda was the Founder and President of the South Asian Law Students Association at the University of Ottawa and also served as a student representative in Faculty Council for Common Law Français. Amanda has graduated with a Bilingual Honours Double Major in Political Science and International Studies from York University, Glendon College, where she served as the Student Chair of Faculty Council and as a Councillor for the Glendon College Student Union. Amanda is fluent in English, French and Hindi and is continually improving her Arabic, Portuguese and Spanish.